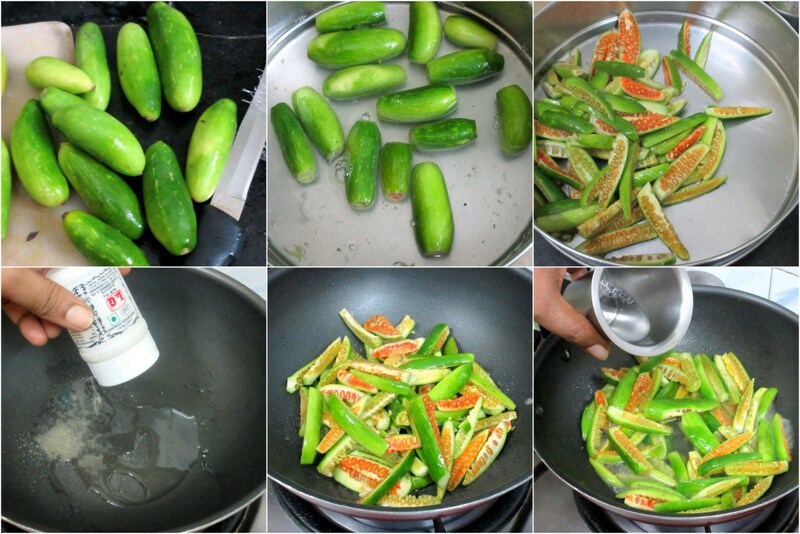 Tindora or Kovakkai as we say in Tamil, is quite a regular vegetable that gets featured weekly. I was so surprised when I came to know Konda loves this vegetable. I was feeling I was such a bad mom for knowing what my kids like. Well that’s the drawback of being a working woman and not be there to feed them their lunch. Kids hardly eat anything in their school. Meaning their lunch boxes hardly come to anything substantial. So we give them rice and dal or rasam when they come back. Many days Konda ends up eating at Amma’s place and so she gets fed and madam never bothers what she eats when she is fed. Amma literally feeds her vegetables mixed with rice and she hardly ever notices. While making the Gujarati Thali, I wanted to settle with simple everyday dishes and easy to access vegetables, that I felt I can include in my regular menu if everybody likes it. So this was an attempt at making this vegetable differently to see if all like it. I made it slight more spicy because of my spice loving folks. Naturally the boys didn’t eat it, they were fine with just Rotla and Gal. Heat oil in a pan. Add the hing. Then add the tindora. Saute for a couple of minutes. Sprinkle water and cover with a lid. Keep sauteing in between to ensure it doesn’t get burnt. 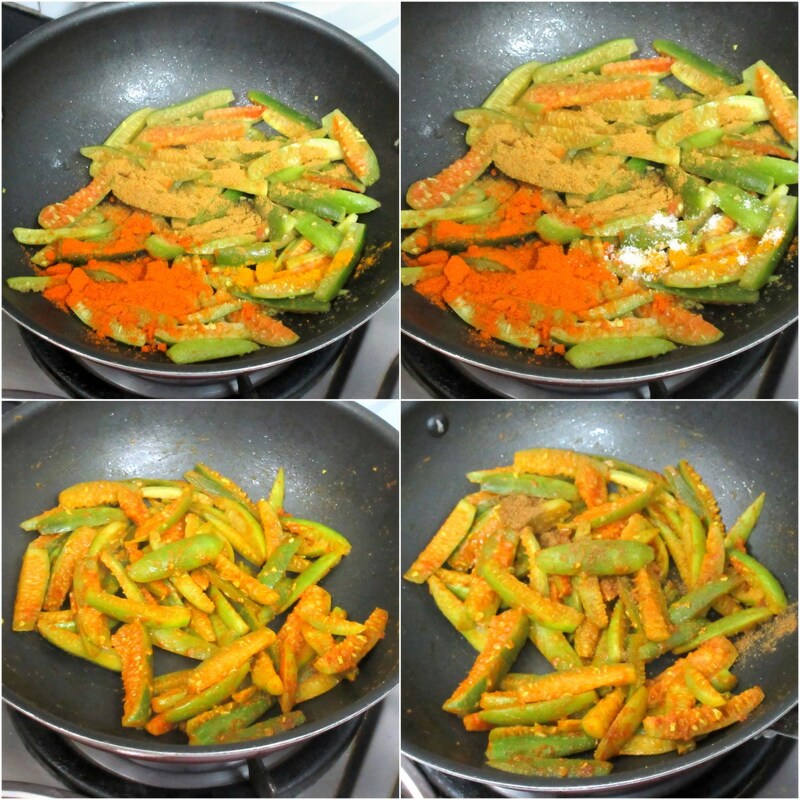 After cooking for 5 -7 mins, add turmeric powder, chili powder, coriander powder and salt. A different way of preparing kovakka. Am tempted to try it out. I can have this tindora nu shaak with some rice happily.. I loved it when I made it for gujarati thali.Looks delicious. Very similar to how we make it – minus the spice. Tastes great! 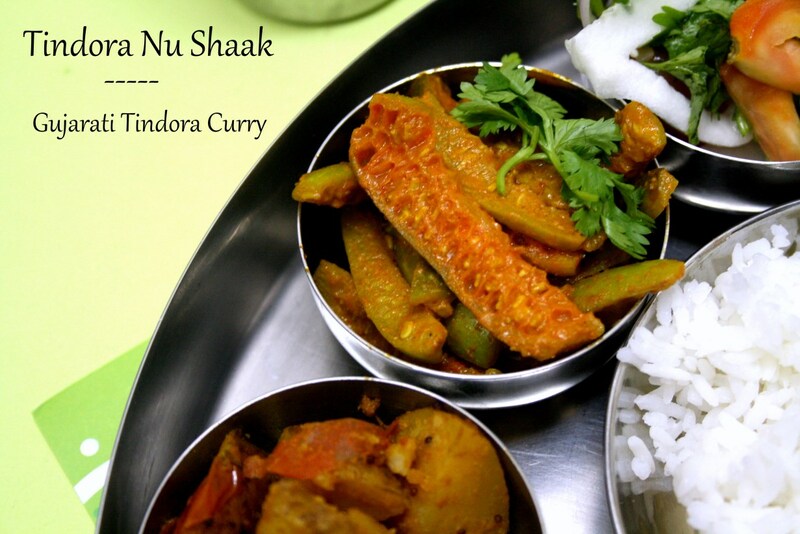 Love this simple and easy to make tindora curry. I julienne the kovakkai to and make. Love this simple and flavorful curry. Simple, everyday kind of a curry. Good one.